"The Score Is Love All"
Virgil's insight and direction come from his experiences as a Pastor, marriage and family counselor, coach, athlete, husband and father. Living in Lawrence, KS, he served 16 years as Pastor of the First United Methodist Church. Virgil and his wife Elaine have been married over 40 years and have three children, Kevin, Kip and Kara. All of them received tennis scholarships. 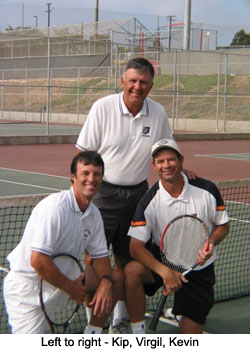 Kevin and Kip have been directors of tennis clubs in Southern California. Kip competed on the Pro Tour for four years, earning a world-ranking and was an NCAA All-American. Kevin was an NAIA All-American and runs USTA tournaments as well as adult and junior leagues involving approximately 2,500 players each year. Kara won a National junior doubles title, and played in the 1992 NCAA Championships for the University of San Diego. The entire family conducts adult and junior tennis camps throughout the year. This book is about parents and kids working together, and offers real solutions for parents and kids who share in youth sports. "This book, like Virgil's sermons, is full of insight and humility, from a man who started out to be a coach and ended up a Pastor." Tracy Austin, former #1 world-ranked women's professional tennis player. Two-time U.S. Open Champion, mother of three boys. "An excellent foundation for enhancing communication between parents and kids." "This is a must read book for parents who are striving to find healthy and constructive ways of nurturing their child's growth as an athlete." "The Score Is Love All" is available for $16.00 (which includes shipping and handling). To order, click on one of the links below. Allow 1-2 weeks for delivery.